Dungeons and dragons has been one of the singularly unique and engaging roleplaying experiences since its introduction over 40 years ago. The timeless tabletop game has been at the center of immersive adventures told through collaborative storytelling, all it has ever required is one dungeon master to set the stage and a group of players willing to star in the role of heroes. At the core of the game has always been a compelling set of rules that both established a foundation for the story and gave the dungeon masters and players the opportunity to explore their limitless imaginations, with few restrictions. Through the digital age we have seen many attempts to fuse these rules into the structure of a video game, in fact many RPGs owe at least partial inspiration to the role playing rulesets of the Player Handbook’s. While many games have captured the feel of the Dungeons and Dragons setting and gameplay, the collaborative storytelling experienced by a group of players sat around a table has remained lacking in its recreation. The newest entry into the D&D video game pantheon Sword Coast Legends, developed by n-Space and published by Digital Extremes due for release on PC September 29, 2015 and PS4 and Xbox One later this year, while featuring a fully realized story campaign, looks to make inroads into capturing the iconic tabletop multiplayer feel with it’s robust Dungeon Master Mode. Set in the legendary Forgotten Realms setting, the game’s story will take place in the famous Sword Coast region of Faerun, a region that features some of the most beloved locations in Forgotten Realms lore. With industry veterans with past experience on Dragon Age: Origins at the helm in partnership with D&D parent company Wizards of the Coast, the single player campaign will be a deep narrative that explores and features many of the locations, monsters, and characters that fans of the tabletop game, Forgotten Realms settings and RPG fans in general have come to love. The look, feel and joie de vivre of Sword Coast Legends builds off of the nostalgia of past D&D games like Baldur’s Gate and Icewind Dale. It’s difficult to take one look at the game and not feel those familiar fuzzies as we are transported to Faerun for the umpteenth time and the first time. The beautiful and dangerous port city of Luskan. 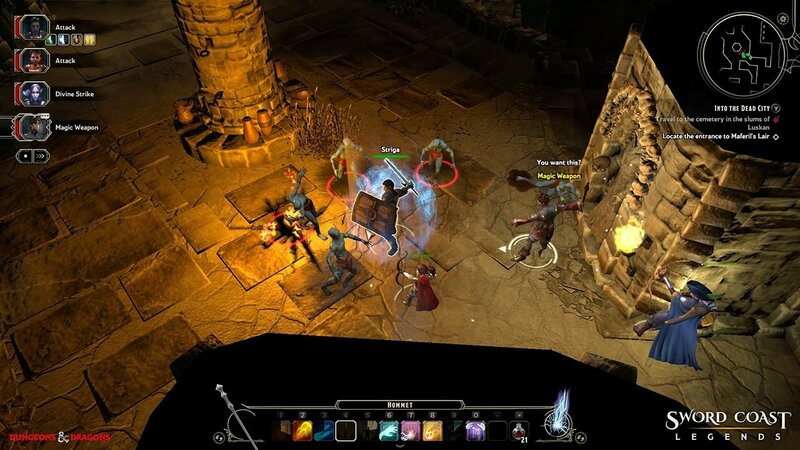 The gameplay features a top down, tactical, party-based approach which allows players to pause time and queue up attacks and abilities. Character creation, customization and in-game actions all are based off of the most recent D&D 5th Edition ruleset which is both instantly familiar to long time vets, and also very approachable to newcomers. Players can choose from 5 races and 6 classes to flesh out their 4 person party. 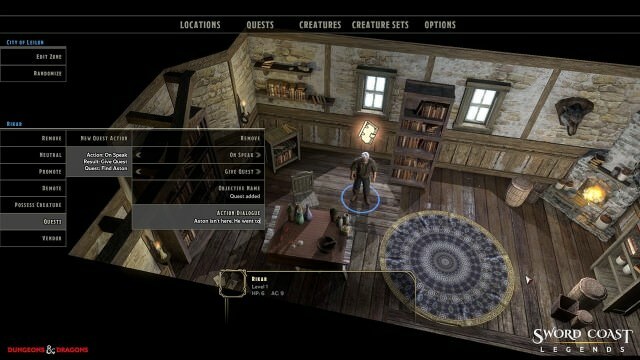 Along the way, various NPC companions will join players on their quests. The campaign can be experienced solo, or with up to 3 other players in online co-op. A party that sticks together, kills together. In addition to a deep campaign mode, the multiplayer elements extend to perhaps Sword Coast Legends’ most intriguing gameplay feature: Dungeon Master Mode. In what equates to a 1v4 format, players can assume the role of Dungeon Master and craft a fully fledged campaign of their own, that can be played by a party of players. Dungeons can be created and modified in real time, with DM’s able to change the difficulty to react to their players’ successes or struggles and even take control of bosses directly to up the challenge for the party. Arrange your monsters and plan your traps. 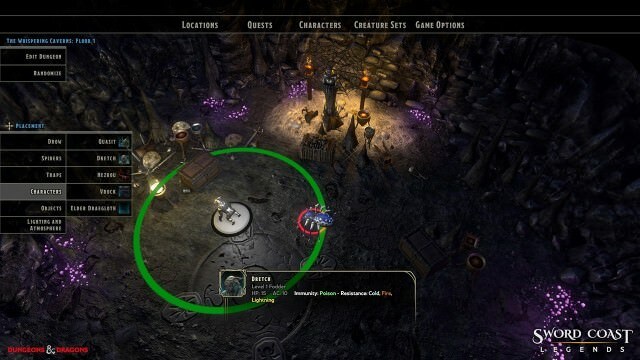 The campaign creation toolset features a robust editor which gives aspiring Dungeon Masters the ability to create and edit custom quests, locations, and creatures. Do you fancy a branching murder mystery that begins in the mountains and comes to its climax fighting an undead army deep in catacombs? Check. How about recovering a world impacting item burgled from a distraught NPC? That can be easily done. The options for story realization are endless, and quests can be chained together to form a truly world spanning epic. It doesn’t get much more D&D than that. That intimate, dynamic and unpredictable experience is the kernel of the tabletop game and responsible for the profound attachment by millions. Capturing that essence and transferring it to the digital realm is no small task, but after viewing gameplay footage and developer streams, n-Space’s passion and understanding of the game’s emergent magic is evident. Nearly every element of campaign creation can be customized. The release of the 5th Edition ruleset brought with it a new strategy, which see expansions that span all the different platforms of the D&D universe. 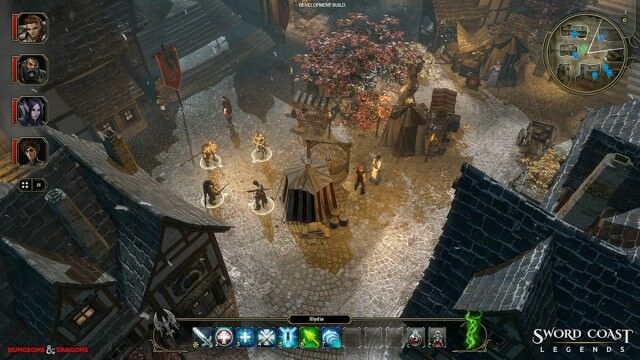 Now when a major expansion is released for the tabletop game, players can expect to see complimentary expansions in the MMORPG Neverwinter and in Sword Coast Legends as well as new novels in the literary universe. This pervasive content creation creates a diverse and large playerbase who are all experiencing these epic stories through the lenses of different mediums. Followers of 1 platform will be satisfied completely, followers of them all may consider a permanent residence in Luskan. The forthcoming Rage of Demons expansion will be the first that includes all 3 platforms. 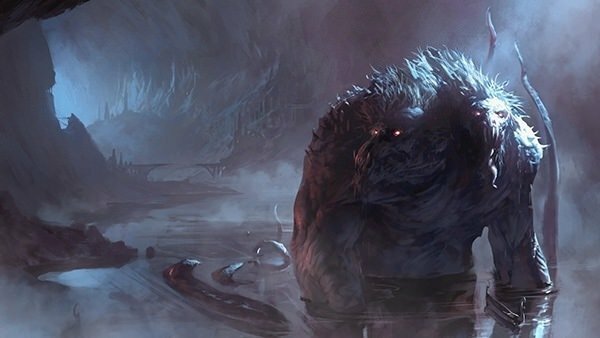 In it players will travel to the dangerous Underdark, take on Demons spawned from the chaotic and evil Abyss, and yes, the legendary dual wielding ranger Drizzt will be featured. Players can expect new locations, monsters , race and class options to be a part of the expansion packages. Meet Demogorgon. Demogorgon is not friendly. Even his 2 heads hate each other. The ancient art of storytelling is woven into the cultural DNA of humanity, and its value and need is as relevant now as it ever was. D&D has always been a fantastic platform for teasing out the myths, archetypes and symbols inside of us all and subsequently allowing us to share and experience them with others. 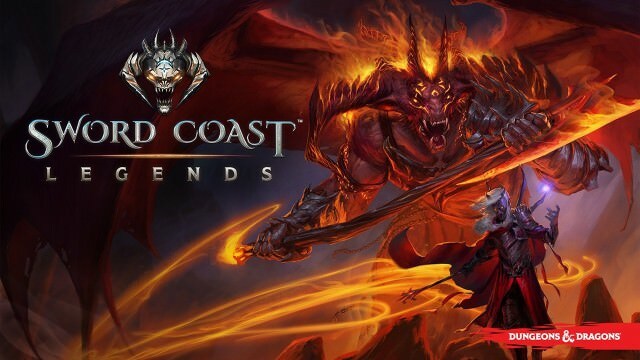 Video games are at the forefront of bringing people together from around to globe to play, and Sword Coast Legends hopes to deepen that and bring us together to tell the stories that course through us all. Yes! As an ex-dungeon master in both forgotten realms and greyhawk I’m looking forward the the DM Mode and creating some awesome dungeons! It’s exciting stuff! I’m all about the table experience, but this is shaping up to be a nice compliment. I’m thinking we can get a community group set up to do some campaigns together! I love the idea of the dungeon master. I hope we can get a Fextralife Dungeon and have members fight it out vs E haha. Also, the wiki is looking awesome already. Having seen a bit more of the Dungeon Master mode, I honestly can’t wait! I think E and I will have to make some Fextralife Dungeons and see how popular we can make them across the net. This game is looking pretty kicking, we’ve been able to see some footage of head start access that has shown off campaign creation and it continues to look like something we can sink hours into. This Game looks like it will be fun to play. Oh the dungeons that could be created. Mate! This I am WELL UP for this!! I almost flunked my first year at Uni spending too much time as a DM instead of studying. Lol yeah, dmin’g a live campaign is a huge time investment. DM’s are the real heroes. I am also in the head start weekend, I’m playing around with character creation mostly for now. So many options. I can see myself spending more time creating dungeons and campaigns than playing by a wide margin. I’m constantly dreaming up scenarios in my mind’s eye. Let me know if you get to play this weekend. Hopefully we can have a nice player’s guild here. [*]Co-op is a nightmare if pause and play is disabled. You all just die. Every time, and within seconds. This is probably a game best alone with your own party of 4 or with 3 trusted friends and coop pause and play enabled. There is just too much happening to reliably play this real time. [*]Dungeon Master mode in particular is very wide open to your imagination. It probably could have been sold as a separate game.